Haunted Horror, Vol. 4: Candles for the Undead and More! 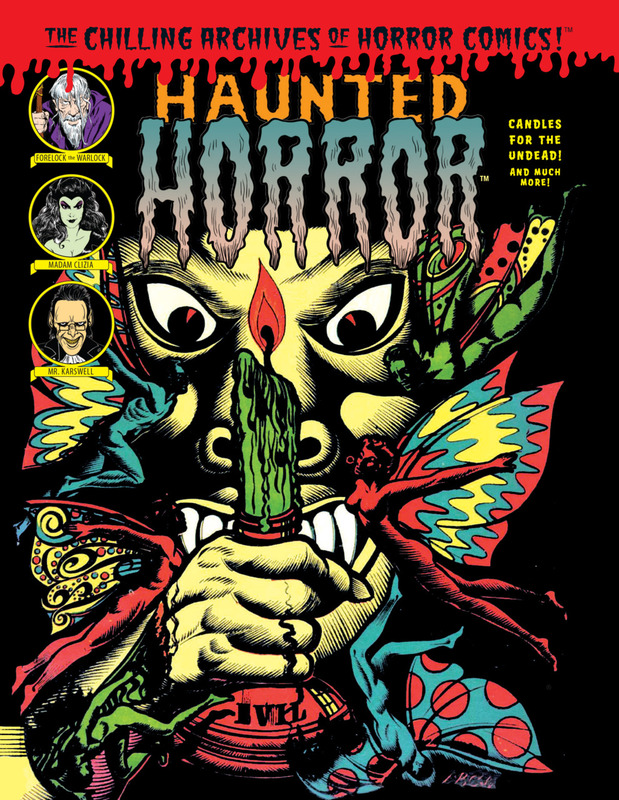 In this bizarre, lawless, ghoulish, gruesome, terrifying frightfest of a book you’ll read: “Candles for the Undead,” “The Monster’s Ghost,” “Pray for the Vampire Horde,” “The Witches Come at Midnight,” “Your Head for Mine” and many more mind-rotting comics! When I first opened this book in the mail, my husband, who is a horror film reviewer, was ecstatic and couldn't wait to look through it. With artists like Bob Powell, Joe Orlando, Warren Kremer, Howard Nostrand, Ross Andru, Mike Esposito, Rudy Palais, Lee Elias, Lou Cameron, and Jack Katz, there's no way this book will disappoint. In the opening pages, Artie Delmar provides the reader with instructions for the reading the comics within. In seven steps, Delmar suggests that the reader: wait until dark to read (this reminds me of Corey Haim reading comics at night in The Lost Boys), find a nice, dark place to read, play some scary music if you can't conjure up a storm, read the book from cover to cover in its natural order, read left to right and down, continue reading all of the comics (I mean, why you would stop halfway through? ), and finally, celebrate because you have "successfully read" the book which Delmar describes as a "collection of classic comics about ghouls, ghosts, graves, death, dismemberment, murder, mayhem, demons, devils, witches, werewolves, vampires, zombies, and various things that go bump in the night." Overall, the comics are gorgeous, especially the covers. Deep reds and greens explode on the pages in rich, bloody, slimy tones. The stories are equally compelling and frightening. When I first read through the first comic "The Cult of 13 Ghosts," I was by myself in the bedroom with the lamp on low (as instructed). About halfway through, I made my way to the living room where my husband was in the adjacent room so I wouldn't be alone. Once I was comfortable (and less afraid), I was completely absorbed until I reached the end. If you love horror and/or comics, there's no way you walk past this book on the shelf next week. Check it out at the library, buy it on Amazon; either way, get this book before Halloween and settle in for a spine-tingling journey through mystery and mayhem.